The Walking Dead in its mid-season premiere on Sunday revealed its next mother-to-be: Rosita (Christian Serratos). It’s learned Rosita, who established a romantic relationship with Father Gabriel (Seth Gilliam) sometime during a six-year time jump, previously had a dalliance with Siddiq (Avi Nash) that resulted in her surprise pregnancy. This poses a problem for Eugene (Josh McDermitt), who has finally mustered the courage to confess his own romantic feelings towards Rosita despite her loving relationship with Gabriel. 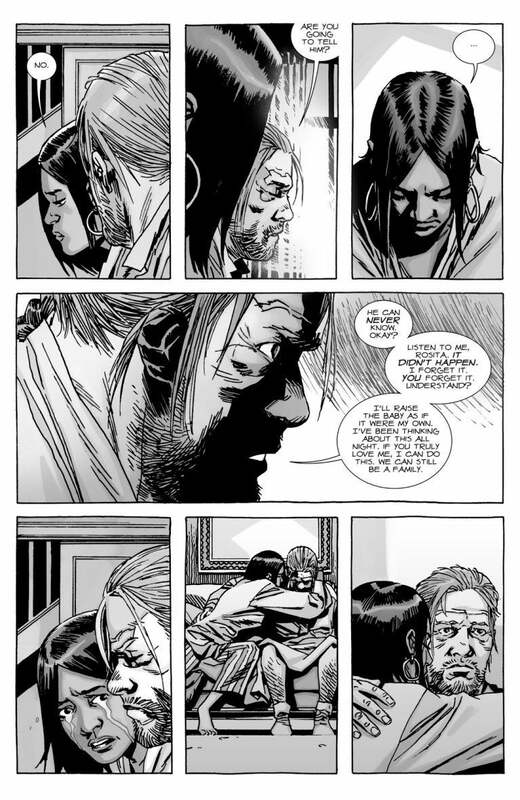 A similar triangle played out in The Walking Dead issue #133, where Rosita — who had entered into a romantic relationship with Eugene — tearfully admits an affair that left her pregnant by a then unnamed father. Asked if the father knows she’s pregnant, Rosita says he doesn’t. Asked if she’s going to tell him, she has no answer. “He can never know. Okay? Listen to me, Rosita. It didn’t happen. I forget it. You forget it. Understand?” Eugene says. Later, during a fair organized by the communities, Rosita is abducted by Whisperer leader Alpha. The pregnant Rosita is subsequently decapitated and her head is one of many placed on pikes as part of a makeshift border erected by the territorial Whisperers. 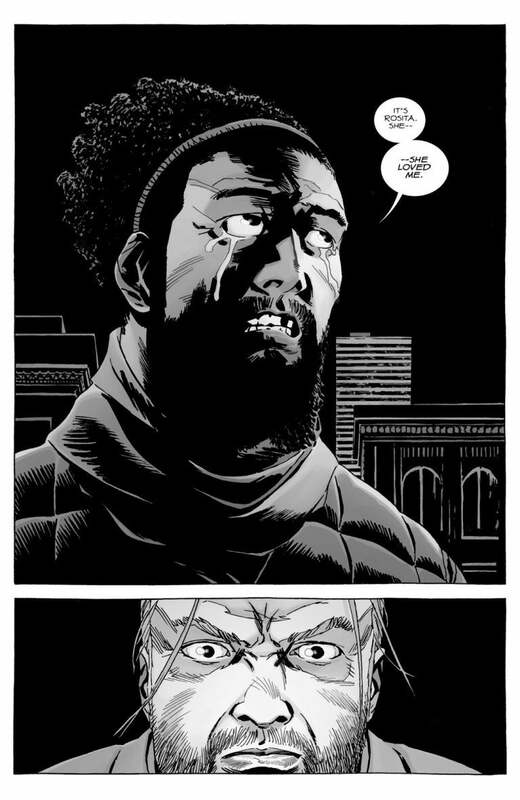 The comics would later reveal Siddiq as the father of Rosita’s baby in issue #170, when Siddiq confessed and apologized to Eugene for being the other man. Siddiq tearfully admitted Rosita loved him, prompting Eugene to remember when she denied the affair meant anything. Eugene quickly forgives and then comforts Siddiq, acknowledging it must have been hard to lose Rosita and not be able to talk about it. McDermitt in October hinted the show might explore “larger themes” surrounding the Rosita-Eugene pairing of the comic books without adapting the exact relationship. “Here’s the thing with what the show does in terms of the comics, it’s not always by the book,” McDermitt said at Walker Stalker Con Atlanta. “So, it’s not just like, ‘We’re gonna make it bigger and better.’ ... If we’re gonna see anything from the comics between Rosita and Eugene it’s gonna be some of these larger themes that we’re seeing in the comics. The Walking Dead airs new episodes Sunday at 9/8c on AMC.